Curtis is the co-founder and co-owner of Splash Page Comics. He is the creator/writer of Building Bridges, a YA one-shot comic about teenage superheroes, bullying, jealousy and a spaghetti bridge tournament (illustrated by Drew C. Kelly). Currently, Curtis is writing the Legend of Beard Fist, a series he co-created with business partner and illustrator, Drew C. Kelly. Beard Fist is a coming-of-age tale about a young heroine who travels with her mythic hero friends. When Curtis is not behind his computer writing, you can find him at one of the many different comic book conventions in the New England area, at a local cinema or behind a graphic novel. Growing up in Massachusetts, Drew always had a fondness for the forest and the adventures that lie within. He uses these ideas as inspiration when illustrating the Legend of Beard Fist, the comic that he and Curtis M. Parvin co-create. Drew also enjoys wandering the wilderness of Skyrim, or building massive castles in Minecraft- both of which are also inspiration for Beard Fist. Since he was a kid, people have asked Drew what he wants to be when he grows up, and he would always answer, “I want to have my own comic book.” So I guess dreams comes true. The Legend Of Beard Fist: Ophelia, a woman who once traveled with the legendary Beard Fist, tells her tales of adventure to a new friend, Sima. And what better place to start a story, than the beginning? Welcome to the show Curtis and Drew. Thank you for taking the time to sit down with us and talk about your work. Curtis, could you tell us a little bit about yourself and what you do? Drew, follow up with telling us a little bit about yourself and what you do? 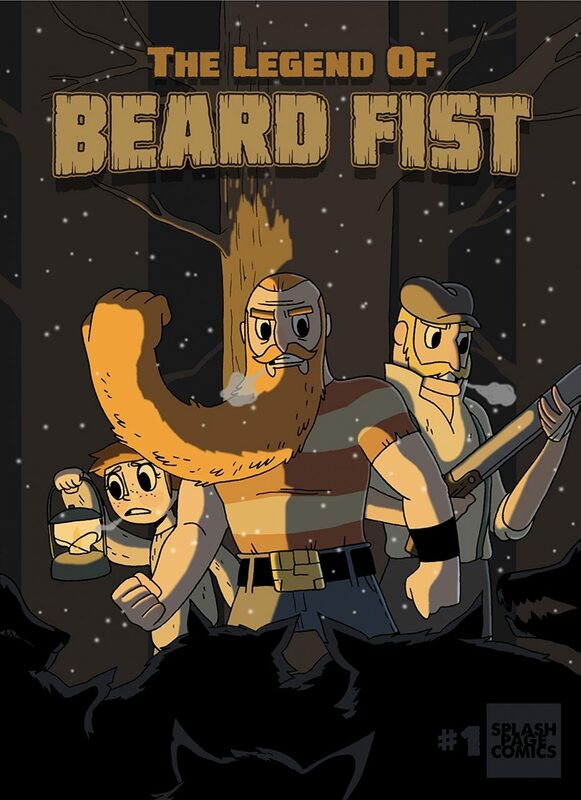 How did you think of “Beard Fist”? Legend of! Do you have beards? Will you ever tire of beards? Who is the artist? Tell us about your tools. Is this all digital? Is any part traditional? Where is my T-shirt? Is it a work in progress or did you carefully think about each decision. How much effort do you put into drawing realistic beards? Collaboration often means more thought to scheduling that a solo project. How do you guys approach your schedule? What is your current schedule? Who do you answer to? Who does the beard’s share of the writing? Is it 50/50? Tell us about collaboration? Are you guys local to one another? Are they all beard jokes? Of course not. Where do you go for inspiration? You are on Comixology! Online vs Print. Which is the strongest for the comic? Do you focus on one more than that other? What else is going on over at Splash Page?